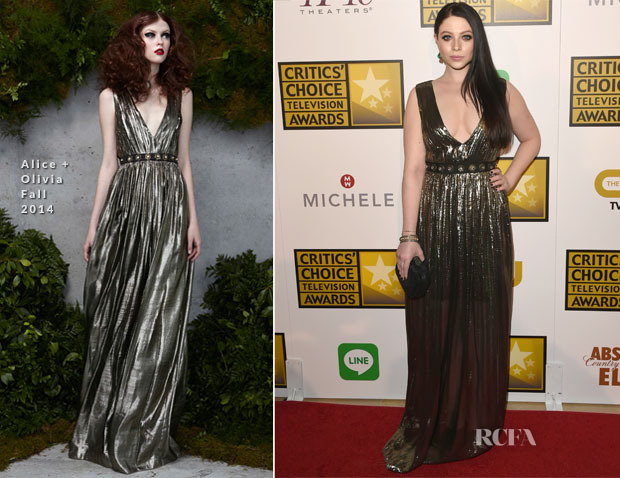 Michelle Trachtenberg attended the 4th Annual Critics’ Choice Television Awards held at the Beverly Hilton Hotel on Thursday (June 19) in Beverly Hills, California. The former ‘Gossip Girl’ actress wore an Alice + Olivia Fall 2014 gold lame V-neck pleated gown accented with a studded waistband. Tailored to showcase plenty of cleavage, the look was styled with a black clutch and emerald pear-shaped earrings.